Defense manufacturer Sikorsky is in hot water again. WTNH News Channel 8 Investigative Reporter Alan Cohn recently received internal Sikorsky documents detailing difficulties with their parts division. Essentially, a very important part fell off the helicopter in flight, placing all those on board in an extremely hazardous situation. This recent find has finally brought George Klug, Sikorsky’s Vice President for Quality, out of the woodwork to explain what is happening and how these faulty parts found their way on to United States Navy Seahawk helicopters. "No manufacturing system is perfect [,] we strive for perfection [but] we don't always reach it so getting people to identify the issues to address is what we're about here," stated Krug in the interview with Cohn. Unfortunately, according to Cohn’s report last night, 41 more instances have been found. What could be the cause for this inability to reach perfection? One possibility is that Sikorsky has cut back on their quality inspectors from 70 to 8. Krug claims that many of these inspectors have been moved to the facilities where the parts are manufactured to improve quality control. If that were the case, the number of issues Sikorsky is having should not be increasing at such a rapid pace. According to another internal document from Sikorsky, their “High Visibility Issues” have been on the rise for years and reached their highest point this past January. The Defense Contracts Management Agency (DCMA) is also having a hard time with the quality of parts from Sikorsky. February 4, 2015 marks the start of bladed ground testing, a major milestone, for the S-97 RAIDER™ program. During the ground runs phase, the S-97 RAIDER team is testing the first of two aircraft prototypes as a completed system for the first time. The team will perform initial ground tests with the aircraft tied down and will focus on verifying correct operation of the propulsion system, drive train, rotor control system and pilot-vehicle interface. Citação de: "Joe Gould, DefenseNews"
The Sikorsky S-97 Raider hit an important milestone Friday with the successful first flight of its experimental rotorcraft. The S-97, with two pilots, took off at the company's West Palm Beach, Fla., facility about 7 a.m. and performed all of its proscribed movements over roughly an hour. The flight test took on the basics — three take-offs and landings, and all cardinal movements at 10 knots — before more advanced tests over the year. "This was, we feel, a really spectacular day for Sikorsky and aviation in general," said Mark Miller, Sikorsky's vice president for research and engineering. "It's not every day you have a first flight, and when you add on top of that a very differentiated, new and compelling product like the S-97 Raider, it makes it even more special. "We're very excited, it was everything we wanted it to be and more, and it's the start of a new generation of helicopters and capabilities that we're really excited about," Miller said. With the platform, Sikorsky officials said the company was firmly planting its flag for the Army's future vertical lift - light concept and armed aerial scout requirement. The S-97 was envisioned at one point as a contender replacement for the US Army's OH-58 Kiowa Scout, but the Army changed plans and scuttled the armed aerial scout for budgetary reasons, using the AH-64 Apache on an interim basis. Sikorsky S-97 RAIDER™ First Flight. Our S-97 RAIDER™ helicopter successfully achieved its first flight at the Sikorsky Development Flight Center in West Palm Beach, Fla today! Congratulations to Chief Pilot Bill Fell, Co-pilot Kevin Bredenbeck and the entire RAIDER team. Citação de: "Andrea Shalal, Lewis Krauskopf / Reuters"
Lockheed Martin Corp has agreed to buy United Technologies Corp's Sikorsky Aircraft for over $8 billion, two sources said on Sunday, cementing a deal that would confirm Lockheed's dominance in weapons making and giving the Black Hawk helicopter to the maker of the F-35 fighter jet. The deal will add further heft to Lockheed, which already has annual revenues of around $45 billion and dwarves its nearest competitors, the defense business of Boeing Co and Northrop Grumman Corp. It will make Lockheed less reliant on the $391 billion F-35 fighter jet business, while expanding its overseas sales by adding Sikorsky's iconic Black Hawk helicopters to a product line that already spans everything from satellites to naval ships. The two companies plan to announce the deal on Monday before both report second-quarter results on Tuesday, said the sources, who were not authorized to speak publicly. It will be Lockheed's largest acquisition since it bought Martin Marietta Corp for about $10 billion two decades ago. It is the first major strategic move for both United Tech Chief Executive Officer Greg Hayes, who was elevated to CEO from finance chief in November, and Lockheed CEO Marillyn Hewson, who took her job in January 2013. United Technologies and Lockheed officials declined comment. Textron Inc, parent of Bell Helicopter, had submitted a bid for Sikorsky, but dropped out of the bidding after the price rose, according to several sources familiar with the matter. Both helicopter makers have seen revenues drop due to lower demand from the oil and gas sector. 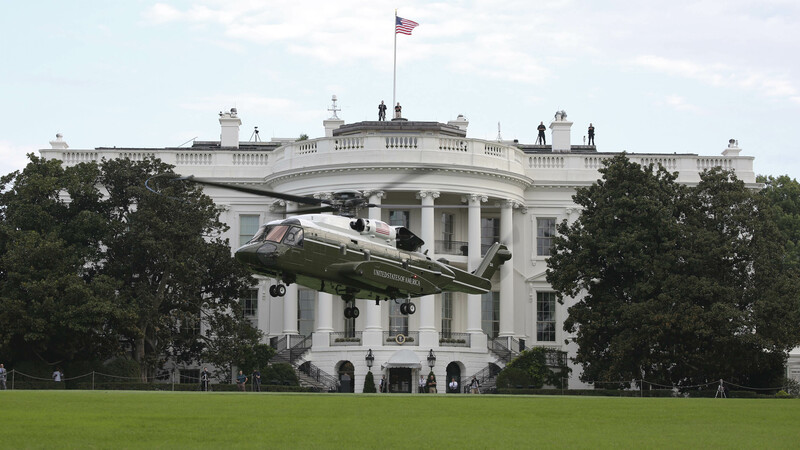 Pentagon officials last week said they would carefully evaluate any sale of Sikorsky, saying it was important to the department to maintain competition and avoid market distortions. The U.S. Defense Department can object to a merger involving its key suppliers during a federal antitrust review, which in this case could be led by the U.S. Justice Department. Industry executives do not expect antitrust objections since Lockheed does not build helicopters, but said U.S. officials could ask for certain written assurances given Lockheed's expanded scale. O próximo helicóptero presidencial dos EUA, o VH-92A construído pela Sikorsky, aterrissou com sucesso na Casa Branca durante seu primeiro teste em setembro, informou a NAVAIR nesta semana. O AW101 tinha ficado mais bonito, mas pronto preferiram a prata da casa.